Speed and Strength has no shortage of new products being released for 2014. Their biggest challenge is going to be continuing to come up with names as dynamic as their offerings. With collections such as like the Seven Sins, the Rage With the Machine, and the Trial By Fire, their jackets evoke images of a post apocalyptic world where the motorcyclist reigns king. Leading the pack of their new summer offerings is the “Run with the Bulls” mesh jacket. Speed and Strength are getting nostalgic as they are bringing back the “Run with the Bulls” moniker, this time there is no hoodie included with this aggressive mesh “cattle-herder” of a jacket. A “fierce” mesh frame lets air in while keeping the piercing stabbing of the bulls horns at bay. Armor upgrades now include both removable shoulder and elbow protection as well as a CE rated spine protector. Lockdown waist and sleeve adjusters along with a pants loop keeps the Speed & Strength Run With The Bulls Mesh Jacket in place when the cattle starts buckin'. If the aggressive, “Strong Arm” cut of the Run With the Bulls is too much for you then perhaps you would prefer to fly Under the Radar. The new Under the Radar jacket by Speed and Strength features the same mesh shell and CE rated armor as found in the Run With The Bulls jacket, just with a more relaxed cut. 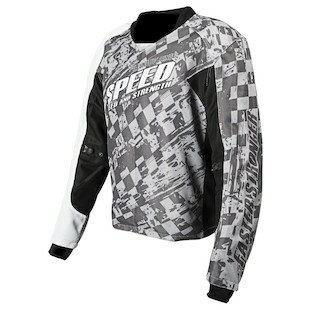 If your “steel steed” sets you in more of an upright, prone position, then the Speed & Strength Under The Radar Mesh Jacket should be just your speed. If using a zipper is as crazy to you as tying a tie then the Speed & Strength Lunatic Fringe Armored Mesh Jersey will pair nicely with the simplicity of your clip-on tie collection. 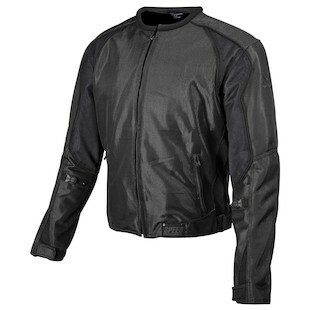 The Lunatic Fringe is a pull over mesh shell that has removable CE rated armor in the Shoulders, Elbows, and back. Adjustments on the waist and the sleeve allow for a secure fit while the belt loop and Lycra cuffs with thumbholes prevent the sleeves from pushing up in the event of a tumble. Each of the Lunatic Fringe, Under The Radar, and Run With The Bulls collections offer something a little different. However, all of these jackets feature a variety of colors and will be available in sizes ranging from Small to 3XL. These are just a small portion of the newest offerings to be released from Speed and Strength as of late. 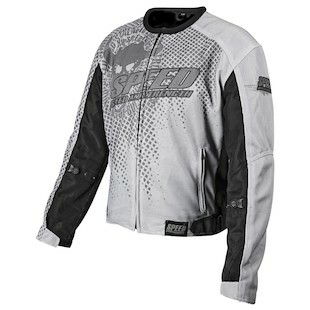 Whether you are a wildly aggressive bull wrangler, crazy for simplicity, or just prefer to relax and not draw attention to yourself, Speed and Strength has a jacket for you.